ServingIntel, Inc. is pleased to announce our newest team member, Vice President of Sales, Bob McDermott. Mr. McDermott comes to us highly experienced in the hospitality industry. Most recently, he was the Owner / Operator of The Beer Bistro in downtown Chicago for over twelve years. The restaurant group brought in on average $3.5M. Mr. McDermott managed all aspects of the business including staff management, performance reviews, revenue and cost reporting, cash management and inventory. Prior to owning and operating, The Beer Bistro, Bob was a District Partner for RDG Chicago. He oversaw the day to day operations of eight Bar Louie restaurants nationwide with sales totaling $11.7 million. He was also the acting Beverage Director for the entire 28-unit organization. Bob was the Executive of 38 managerial personnel and over 350 employees. He supervised professional growth and accountability both to customers and the company. Mr. McDermott holds a BS Degree from The University of Illinois, “I am motivated at getting the job done. At completing a task.” exclaims Mr. McDermott. “I am a self-starter and loyal to the mission. I expect the same in return from my employees and/or employer”. If you'd like to learn more about enhancing your business with a guaranteed ROI solution, please contact ServingIntel at 888-477-7711 or the web at www.servingIntel.com. ServingIntel is an international hospitality technology company that creates point-of-sale and enterprise solutions serving a variety of industries, including hospitality, golf clubs, hospitals and senior living. 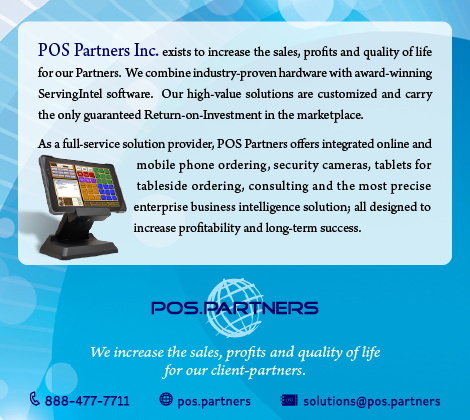 Providing a complete solution of software, mobile hardware, and business intelligence through its ServingIntel.com platform, POS Partners increases revenue and profit in foodservice operations, while enhancing service and quality levels for the guests.